If you know me, HOPEFULLY you know that charity, giving to others, being a light, and helping those around me makes my heart SMILE! If I find a company doing this I normally never let them go, which is EXACTLY the case when it comes to MudLOVE. MudLOVE was started as a way to support clean water projects in Africa. They partner with Water for Good and every product purchased provides one week of clean water to someone in need in the Central African Republic. Along with providing clean water to a country in desperate need of hope, love and basic necessities, their products are an every day instrument of encouragement and inspiration. I wish I could say I was an artist like my hubby, but I am not. I "try" my hardest (shoot, you should see some of the ceramics my parents still have of mine that I created in my high school classes! ), but my lack of talent helps me to appreciate those who have those abilities even more (especially those who use that talent to make a difference in the world)! So when this package from MudLOVE arrived in my mailbox, to say I was STOKED would be an understatement. I mean, I LOVE me an ARM PARTY (DUH! ), so working with a company that makes AWESOME wrist candy AND helps bring clean water to the Central African Republic is RIGHT up my alley! I was sent a classic "be the change (pink)" band, a classic "inspire (turquoise)" band, a classic "never give up (lime green)" band, a classic "shine (yellow)" band, and a custom "runner (gray)" band. Can you say BEYOND GENEROUS?! patients having a rough day at a local nursing home as part of #Carlees31. You gotta "shine" while at the beach, #AmIRightOrAmIRight?! OBVIOUSLY I had to wear my "runner" band while RUNNING! I love that the bands are not only cute and inspirational, but also comfortable. The elastic is able to be sized up or down to fit most any one's wrists (and I have tiny ones). The clay they use is 100% non-hazardous and the glazes are lead-free and non-toxic. Although I normally have a lot of wrist candy, I have to say, these pieces are my NEW FAVES! The Classic Bands are stamped with the specific phrase while the Custom Bands have your choice of words/ symbols printed on the surface. And here's the moment you've been waiting for... Not only did they send me all of these goodies, they are offering YOU the option to win some as well. There will be TWO winners selected - the first winner will be able to select one of the Classic Bands and the second winner will be able to create their own Custom Bands. Enter early and often (some of the entries are available DAILY). The giveaway will run through Tuesday, August 25th at 11:59pm PST. I will contact the winners via email (using the email address listed through Rafflecopter) who will have 24 hours to respond and claim their prize. Also, the entries ARE verified, so please make sure you complete the task or I'll have to pick a new random winner. Winner must be a U.S. Resident. Void where prohibited. And, in case you aren't one of the two winners, today is STILL your lucky day! 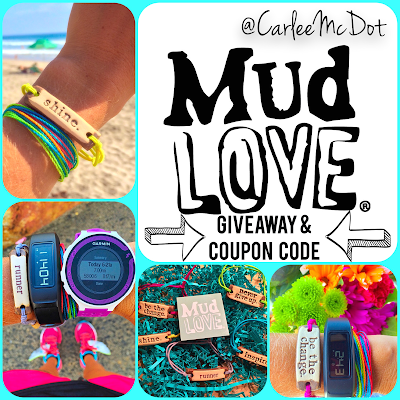 The AMAZING folks at MudLOVE are offering my friends, family, and followers a 20% off coupon (um... that is FAN-FREAKIN'-TASTIC, right?!)! 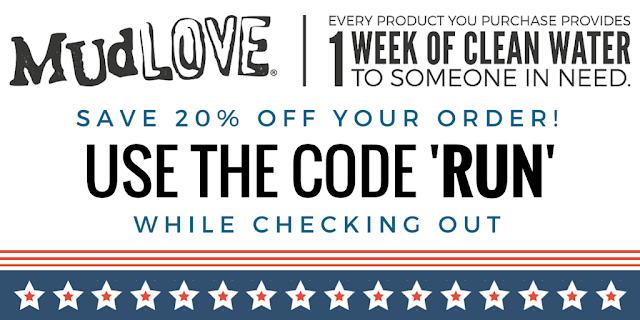 If you place an order before September 30th and use the code "run", you will save 20% WHILE helping others in need. It is a win-win-WIN! What phrase would you put on your band? I would want Never Give Up. It's part of my motto I always focus on. One that says "Be Happy" would be fun! I like the phrase "Run Happy." It helps me remember how happy running makes me, even when I'm struggling during a run. Probably "Faith" or "Be Grateful"
I like either Be the Change or Inspire, but I'd take any of them, they are all so fun! Be the change. It's a great reminder of who I should be everyday. The classic band, freedom, is my fave. The custom would have writer-life on it. I would want Be Bold on mine! I would choose, "Be Extraordinary." I would get something like "Run Happy" or "Relax". I find that whenever I'm running I get so caught up in "having" to do it and sometimes forget to have fun! It would be a great little reminder for me! I'd get "be the change" or "never give up!" :]! I love "Never give up" and also "breathe"...both good motos for me! I'd probably put the quote from the Cinderella movie..."Have Courage and Be Kind". Such a great quote that EVERYONE needs to hear! I would put 'Adventure' on mine. So many good choices! But I'd say either "Never give up" or "Run the Race" or "Perserverance"
I would go with #dowork since that shows up in all my running posts! I would want "adventure" on mine. Hi Carlee! I would put "FIERCE" on mine! I am 4'10" tall, so "Though she is little, she is fierce" is a favorite saying of mine! I would want my bracelet to say STRENGTH to go for what I deal with in my life each day, dealing with mental illness! Thanks for the info on a great organization! I like Strength, or I'd choose a custom one: Progress. Love the idea behind these bands! I'm not sure what I would get... I'd have to look through my own MudLOVE collection again to figure out which ones I don't have yet! I'd choose "never give up" or create my own that says, "giddy-up". I think I'd pick "never give up." For a custom, maybe "namaste" or "shalom." I would want one that says "breathe"
"Breathe" or "runner" or "lovely". I would want one that says Shine. Love the runner one! How fun!!!! I love the never give up and believe bands! Love seeing your posts with these on!! I would love one! Runner is my fave!